Your comfort and safety are our highest priorities. We offer reliable anesthesia options for your oral surgery. Anesthesia keeps you comfortable during surgery. Any time we are talking about surgery, it’s important to also discuss options for anesthesia. Surgical procedures can range from as minor as removing a troublesome tooth, which will likely only require a local anesthetic, to as complex as repairing a traumatic facial injury, which may require full general anesthesia. When patient needs are highly complex, which might include a more detailed medical history or a particularly advanced surgical procedure, we may perform surgery in a hospital setting. Most surgeries, however, can be completed right here in our Lafayette oral surgery office. Anesthesia training is part of the more advanced training that oral surgeons receive compared to general dentists, and we also bring in an experienced anesthesia team. Your safety and comfort are two of our highest priorities, and you can rest assured that we take your needs seriously here at Coal Creek Oral Surgery and Dental Implant Center. Different levels of anesthesia are needed in different scenarios. 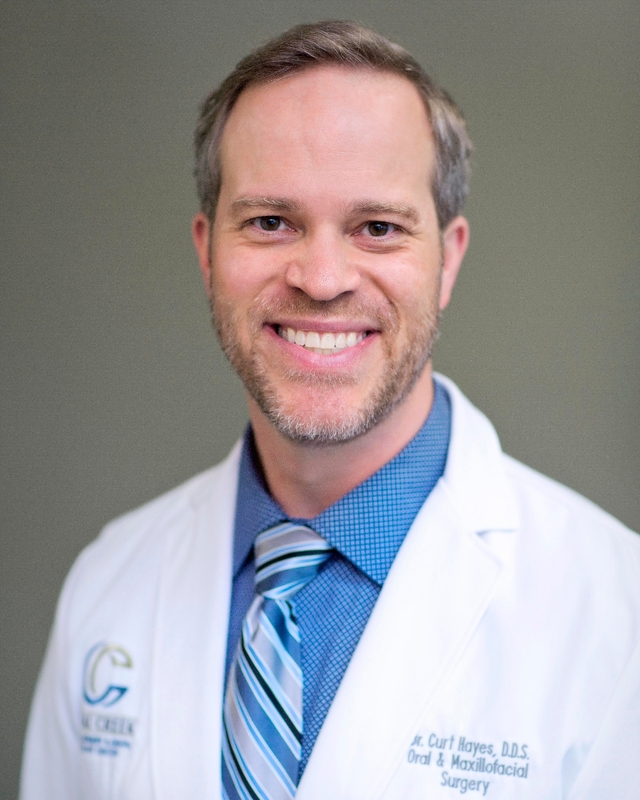 During the treatment planning process, Dr. Hayes will discuss your needs with you and determine the right level of sedation for your particular procedure. Local anesthesia, or numbing, will be done in all cases, no matter how minor they may seem. We want every procedure to be as comfortable as possible. We won’t expect you to “tough it out” or white knuckle your way through any type of treatment, so we make sure that the area is completely numb before we ever begin, and we’ll ensure that you stay numb throughout the entire procedure. If you are feeling anxious or stressed out about your surgery, we can discuss sedation options. Nitrous oxide provides the lowest level of sedation. You might know nitrous oxide by its other, more common name: laughing gas! You’ll breathe the gas through a mask while Dr. Hayes performs your treatment. Despite its familiar name, nitrous oxide won’t make you laugh. What it will do is relax and calm your mind, reduce sensations, and help the appointment seem to go by faster. Side effects are rare and minimal, and the sedation effect wears off so quickly, you’ll be able to drive yourself home. As surgical treatments become more complex and require more time to complete, we’ll look at deeper levels of sedation. Using IV sedation, we can fine tune your level of sedation to meet your needs. While you may be so relaxed that you doze off during your procedure, you will remain conscious. The effects take longer to wear off, and you will need someone to drive you to and from our office and you should take the rest of the day off. When advanced surgical procedures become necessary and treatment is expected to last for a while, we may recommend general anesthesia. During general anesthesia, you will sleep throughout the procedure and only wake up after it is completed. These types of procedures can be completed either here in our Lafayette oral surgery office or we may recommend that your procedure be completed in a hospital based on your needs. Dr. Hayes will provide you with detailed instructions so you know what to expect both before and after your surgery. We want you to feel comfortable, safe, and secure while you are undergoing treatment at our office. If you ever have any questions or concerns, please don’t hesitate to ask. We work with you to ensure a comfortable procedure..
As with so many other parts of the treatment process, this will depend on a number of factors that are specific to your case. As a part of the advanced training that oral surgeons receive, Dr. Hayes has received training in anesthesia. He also works with an experienced anesthesia team to help keep you safe and comfortable. Different levels of anesthesia are available, and we’ll discuss your anesthesia needs as a part of the treatment planning process. Most levels of anesthesia, including local anesthesia (numbing), nitrous oxide gas, and IV anesthesia allow you to remain awake during treatment (although some patients do become so relaxed that they fall asleep during their procedure!). If your procedure is going to be lengthy or you are particularly anxious, we may decide on general anesthesia. This is the type of anesthesia where you sleep through the surgery and only wake up once your procedure is complete. We can provide all levels of anesthesia right here in our Lafayette oral surgery practice, but if needed, a hospital setting is also available for some cases.